When we were in Chicago in January for a friend’s wedding, we ate a little placed called Cassava that specialized these cheesy, chewy little breads. We ate there twice in one weekend because when you’re a gluten-free person in a new place, a restaurant you can eat at is always your new best friend. 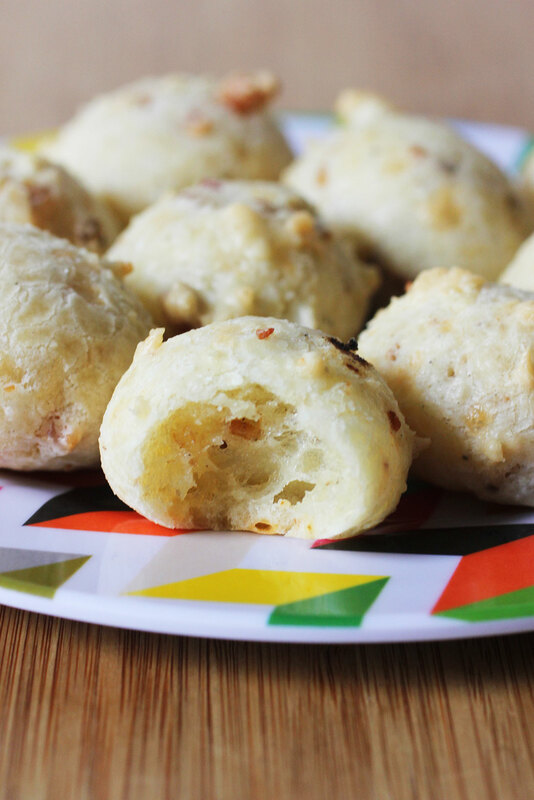 Pão de queijo are a traditional Brazilian cheese bread made with tapioca starch, so most iterations of them are naturally gluten-free. 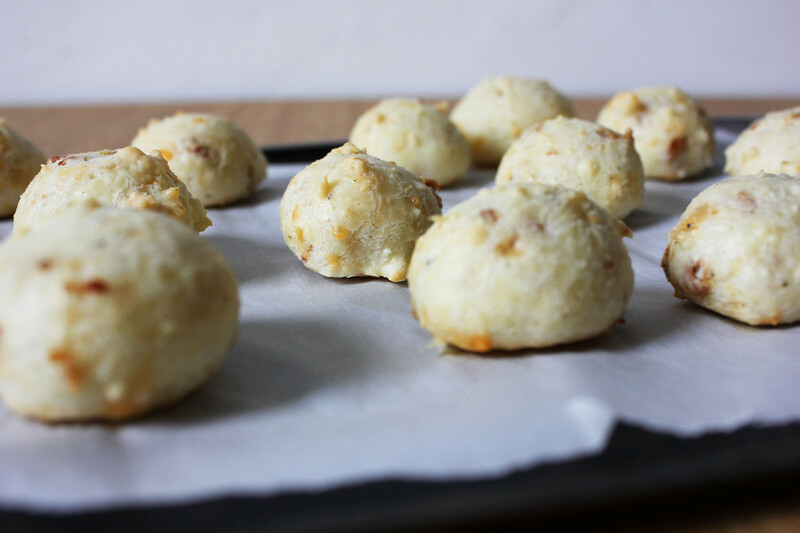 They’re sort of a blank slate in terms of adding your own flavors, so they’re very adaptable. I stirred in some diced uncured petite ham from Vermont Smoke & Cure that they sent me to play around with. I really love these little hams because as one half of a couple who is very conscientious about the meat we eat, it’s so nice to have an option that is a) uncured and certified humane and b) a very manageable size. Most recipes I encountered for these called for a stand mixer and I’m still a stand mixer-less food blogger. So, I used my hands, which made this way more fun and–because you need to work the dough for a while–good stress relief too. Judging by how delicious the final product was, it didn’t suffer from the lack of a stand mixer. I find that these are really best the day they’re made, so this doesn’t make a huge batch. However, you could easily double it for a cocktails & snacks situation or a spring-y brunch. 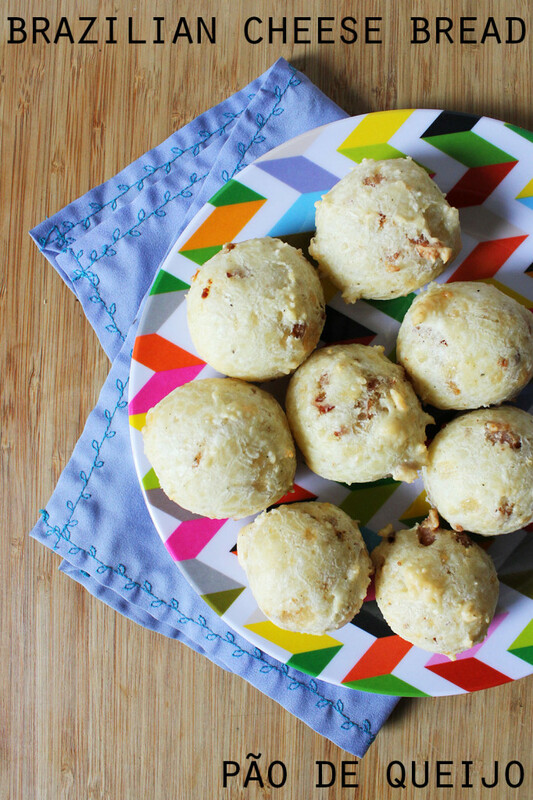 A simple recipe for the traditional Brazilian Cheese Bread, Pão de Queijo. Bring the 1/3 cup of water to a boil in a small saucepan. As soon as it boils, remove from the heat and combine with tapioca starch and oil in a medium bowl. Add the beaten egg and incorporate it into the dough. It’s a sticky job, but I did this with my hands and it worked just fine. Indeed, this is where a stand mixer would come in handy. The resulting dough will have a slightly uneven texture. That’s normal! Fold in the grated parmesan, ham, and a few generous turns of grated black pepper. Using a tablespoon-sized cookie scoop, scoop the batter on to the prepared baking sheet. Bake for 20 minutes or until the tops begin to turn golden brown. Disclosure: I received products from Vermont Smoke & Cure free of charge for editorial consideration. I’ve never heard of these before–they look so good! Plus I’ve had half a bag of tapioca starch sitting around for over a year, waiting for me to figure out what to do with it. Looks like this is the perfect plan! I want this bread in my life so bad – love this recipe! Also, that place you went to sounds great! Gotta love any bread recipe that doesn’t call for a stand mixer. I’ve been wanting to try making these forever! I’ve loved them every time I’ve had them out somewhere in NYC. Your recipe sounds nice and simple. 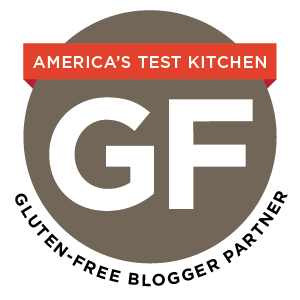 By the way, I also loved this line: “when you’re a gluten-free person in a new place, a restaurant you can eat at is always your new best friend.” Yyyyep. ha! thanks, molly. admittedly, these would be a cinch with a stand mixer. but, they’re definitely possible without. Ooo! I’ve never heard of these before, but they sound tasty! I’m surprised tapioca starch can produce such dinner roll-like balls. Yum. These look awesome! I’ve seen pre-made versions of pao bread showing up in the freezer section of grocery stores and have definitely been intrigued. I love the idea of making it myself, especially with little ham bits. Brilliant!